3/365 : Hot Chocolate, a photo by Lisa-Mari on Flickr. How has your weekend been so far? Mine has actually been a little bit on the relaxing side. I dropped my daughter off at a birthday party today and as I didn't need to stay I headed off into town on my own. I stopped at a coffee shop for some lunch and had an hour to myself with a brie and bacon panini, a large hot chocolate and a new book. It was bliss. After that I went for a browse in the wool section of a local craft shop. Simple pleasures. I then went and picked my daughter up and watched her happily playing through the window before I went in. I love watching her when she doesn't know I am there. She is such a happy and popular little girl. Anyway, enough about my day. 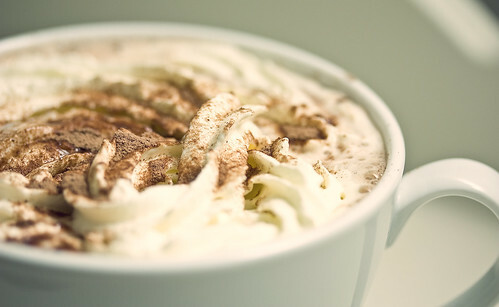 I shall leave you with this beautiful photo of a hot chocolate. You wouldn't think there was much to photograph in a hot drink but I love how the photographer has captured the detail in the cream and chocolate sprinkled on top. That looks delicious, hot chocolate is one of my guilty pleasures - with marshmallows and whipped cream of course! We have started letting Dylan have them occasionally too and I love coming in from a cold walk and snuggling on the sofa with them.